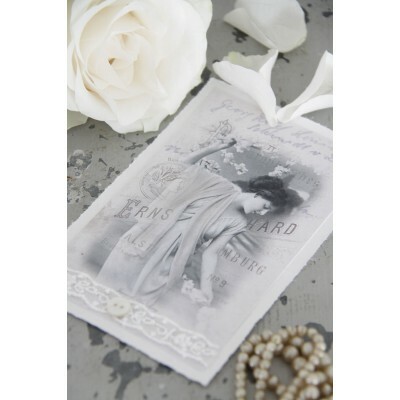 Envelope and card both decorated with lovely vintage lady on a background of text. Set on handmade paper and decorated with fine lace and pearl. Produced in Jeanne dÁrc Livings workshop in Denmark.With a beautiful vintage pantina they are a unique gift card. The full range is available from Jeanne d'Moore's Moora store.